A new species has been spotted! From the artist who bought you the fantastic “Greenie & Elfie” Thai artist Too Natthapong is set to release the all-new edition of his “Kewii” into the wild. Powered by the lads at Unbox Industries this new edition Kewii Galaxy (Glitter Blue) has rumours floating around that Galaxy Glitter Blue was born when two stars collided from the sky above which created this clear blue glitter effect. 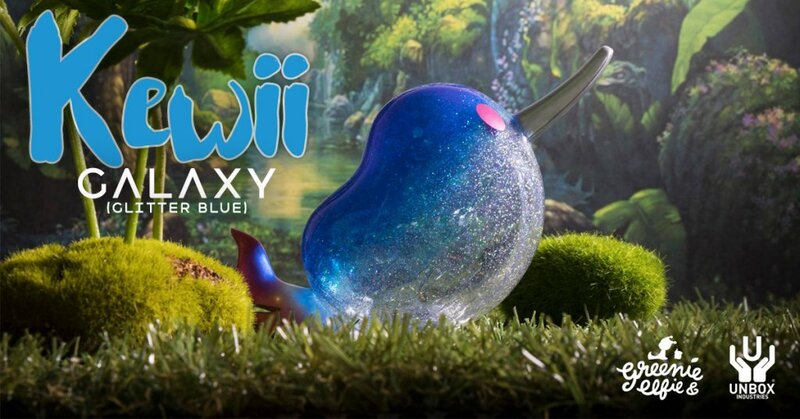 We doubt its true but what we do know is the fact Kewii Galaxy Glitter Blue will be released this weekend, meaning collecrtors can have another chance at owning a “Kewii” especially for collectors who have missed out on the previous editions. Check out our LIVE footage at TTE 2017 Greenie & Elfie booth below.